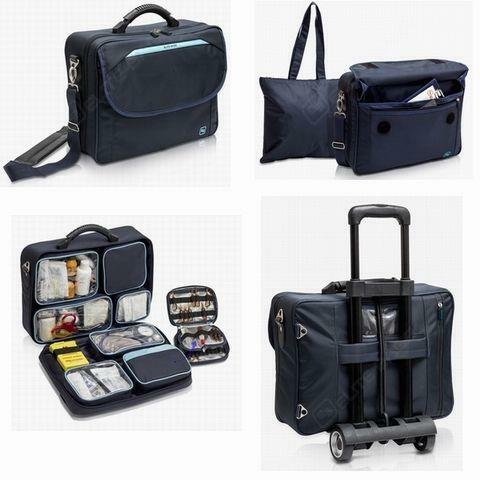 CALL'S is one of the most complete home care bags on the market, its layout and large capacity offers the best organization for the transportation of the healthcare products, giving the confidence to the professionals in the scheduled visits. CALL'S is designed to offer the best organization for the transportation of healthcare products, giving the confidence to the professional using it. 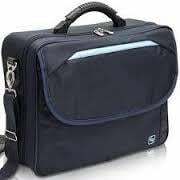 Although it has been designed as a nurse's bag, we are aware of the similarities between the different professions, so it can also be used by veterinarians, chiropodists, nurses or doctors. Detachable compartment with velcro dividers. Isothermal compartment with 43 elastic bands for the medicines. 4 elastic bands to support different materials. Shoulder strap, handle, hidden backpack and trolley band. The interior part of the bag is adaptable for the small bag for home visit extraction samples ref: EB902. Pocket-sized biocontaminated material container and a reusable cold gel included. External measures: 40 x 30 x 13 cm, 15 l.
Maximum recommended contents weight: 5 kg. Parkside Healthcare is a leading supplier of high quality Medical Equipment to healthcare professionals and for home use. 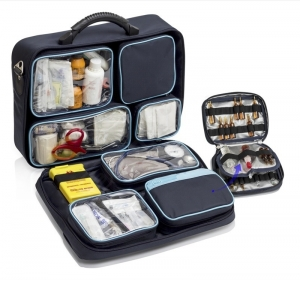 We supply a wide range of daily living aids including portable nebulisers, Tens machines, pain relief devices, pedal exerciser, lightweight wheelchairs, hip protector, blood pressure alarms, pressure sensor alarms, thermometers and hay fever treatment as well as equipment for medical professionals including stethoscopes, doctor's bags, hospital furniture, IV drip stands and much more.We welcome all enquiries both retail and wholesale. Please Contact us to enquire further.